Is There Money To Be Made In The DIY Sentry Gun Open Source Scene? Yes. It’s hard to forget that scene in the Graduate when the young, confused Benjamin is approached by a family friend who tells him the future in two words: sentry guns. 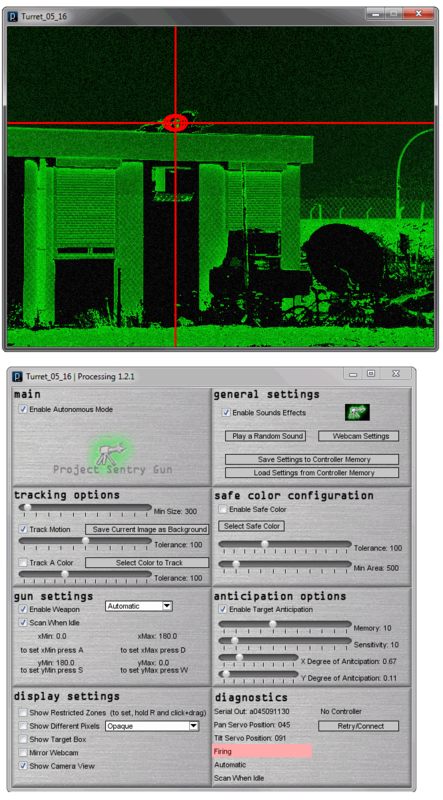 Now you, too, can enter this lucrative world with Project Sentry, an open source tracking sentry gun system that uses a webcam to scan the scene and take down your prey. Built by Rudolph Labs, this project involves a sturdy tripod, an airsoft or paintball gun (or real gun) and a PC. The PC uses a webcam to scan the scene and reports back when there is movement. When the sensor finds a target, it can stick to it and fire at will. It can even anticipate where the target will move, ensuring a steady stream of hot lead during your autonomous sentry operations.
) It’s going to take up all your free time. This will take a lot of effort, probably a few afternoons to build it, then some more work to get it set up with your computer. And, if you are a truly inspired person, you won’t want to stop tweaking and personalizing it after it is finished. Remember: if you don’t do it right, it’s not worth doing at all, so make sure your first sentry gun is your best one. Show your future employers that you have the gumption, the know-how, and the sociopathic desire to anonymously gun down everything in your path with an unfeeling robot. It’s the only way to make it in the world these days.